We can now confidently state that at least in Melbourne fans of one star do not seem to watch the films of another star. As we picked up our tickets for this week’s adventure without subtitles, we encountered more questions about whether we were in the right cinema, and concern that we were about to see a film that we wouldn’t understand. This is despite being at the same cinema at the same time every time there is a new release. We did advise everyone that we knew there were no subtitles and that it was in Telugu. They did seem reasssured when we were able to name the stars in Brindaavanam. So we were given our tickets and took our place in the theatre. The film opens with a typical hero entrance by Tarak and an awesome fight scene which included some nifty bike moves. Tarak, as Krish, is the son of a wealthy industrialist and lives a privileged life lacking for nothing. He also has a girlfriend who is allegedly studying engineering but looks more like a fashion model in the form of Indu, played by Samantha. For some reason she asks Krish to help her college friend Bhumi fend off an unwelcome suitor by pretending to be Bhumi’s boyfriend. Now everyone knows this is a really bad idea, but perhaps she thought that her friend was too traditional to appeal to the sophisticated Krish. It did seem strange that the two were friends, since they appeared quite different in their clothes and attitude, but perhaps this was explained in the dialogue. Or not. Off our hero goes, leaving behind his fancy cars and superbikes to take a bus into the countryside. There was an opportunity for another fight scene using the bus as a weapon, which was great fun, and there were machetes galore to our amusement. When they finally reach their destination, Brindaavanam, we find out that it is a beautiful house sumptuously decorated and furnished, but home to an unhappy family, divided and feuding with itself. Krish resembles Krishna – flirting with the girls, alternately charming and infuriating the family members, pulling practical jokes, fighting, dancing and generally stirring up mischief while also righting wrongs. Prakash Raj with the ‘Amrish Puri Eyeballs of Hate’ (TM PPCC) plays the head of one branch of the family, while Srihari heads up the other side. Their father is the only one who can talk to both sides of the family as everyone else communicates by machete and there are many convoys of black jeeps travelling over the bridge between the two houses. The wardrobe department excelled once again. There are two brothers who have an amazing array of psychedelic shiny shirts, possibly the left overs from Solomon in MAGADHEERA, worn in combination with clashing lunghis. Venu Madhav plays another member of the family with the same bad taste in outer wear, while Krish has an impressive selection of T-shirts and stripey jumpers. The set design is just stunning, especially the interiors. There is also a veritable Noah’s ark of animals featured including chickens, geese, cows, goats, a turtle and even rabbits! We did have to pity the poor animal wrangler who obviously had instructions along the lines of – just get the goats to run through here in a diagonal line between the dancers. The dancing is excellent, although there was a little too much of skanky skin show in the first number. The visual effects and editing in the song picturisations were impressive and really suited the music. We liked the songs before seeing the film, and they improved on screen with the expected excellent choreography and brilliant dancing by Tarak. We did particularly like the bouncing men in their over large straw hats in the Eyi Raja song, and the colourful Vachadura. The traditional appearance of NTR via special effects was used very well and provided a fun conclusion to the film. The dialogue was obviously very amusing as the audience was laughing throughout the speeches, and we suspect that there were a lot of older filmi dialogues included. The second half did drag a little as the story was reiterated a few times as the various characters found out about Krish’s charade, but there was some excellent emoting from Srihari and Prakash Raj to make up for this. In fact, Prakash Raj got to balance his Eyeballs of Hate with his excellent Googly Eyes of Love. Ajay was in great fighting form as the crazy suitor, but once again was destined not to get Kajal as his bride. 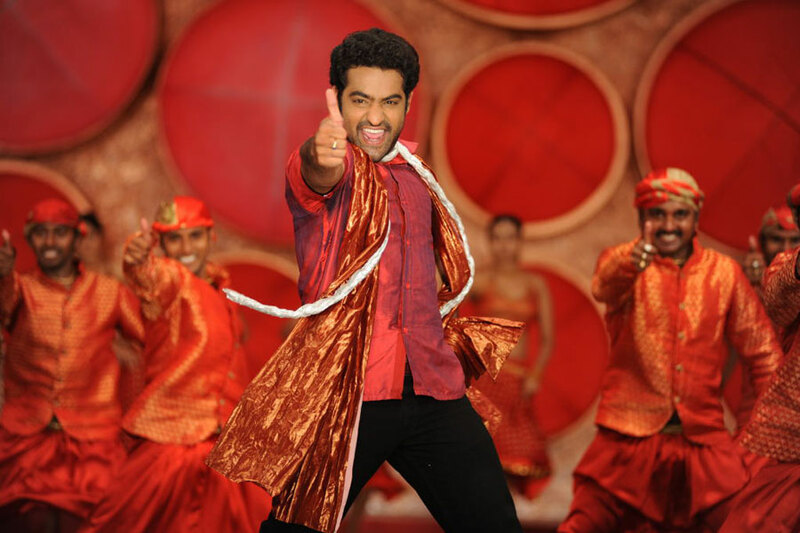 Tarak gives a high energy performance, with his usual excellence in dancing and physical scenes. Both female leads fit their characters well despite those characters lacking any depth. Prakash Raj and Srihari make the most of their roles as feuding brothers. The action sequences, by Peter Hein with a special fight choreographer also credited, were awesome, with plenty of bodies exploding from the inevitable jeep convoys, and machetes in practically every scene. This was a good all round entertainer of a film. We enjoyed it, and the audience’s reaction to the appearance of Brahmi’s bald spot! We give this film 4 stars! This entry was posted in Tollywood and tagged Adventures without subtitles, Brahmi!, Brindaavanam, Dil Raju, Kajal Agarwal, NTR, NTR Jr, Peter Hein, Prakash Raj, S.S Thaman, Samantha, Srihari, Tarak, Telugu, Tollywood, Vamsi Paidipally. Bookmark the permalink.